FRANKFURT MUSIKMESSE 2012 PRESS RELEASE: TC Electronic is proud to announce its latest addition to the bass TonePrint artist lineup: Duff McKagan. 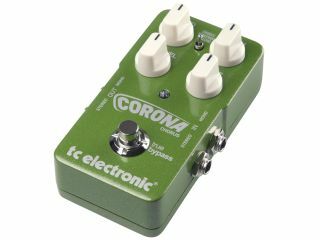 The legendary bassist, who has shaped multiple generations of rock fans with his instantly recognizable chorus-laden bass tone, has chosen TC Electronic's Corona Chorus pedal to get his signature tone as it is heard on timeless classics such as Sweet Child O' Mine. Duff has worked side-by-side with TC Electronic to create a TonePrint that perfectly nails that sound and makes it available immediately as a TonePrint download to fans of both McKagan's music and also great chorus sounds. Duff McKagan's TonePrint, aptly named 'Duff Chorus,' is the purest representation of his signature chorus sound as every rock fan on the planet remembers it. 'Duff Chorus' utilizes the Corona Chorus pedal's Tri-Chorus setting and the effect is actually made up of multiple chorus types that slowly modulate and result in a subtle yet pronounced sound with added sparkle and shimmer. "Duff was high on our wish list for the TonePrint program," says Morten Ehlers, TC Electronic's Bass Products Specialist. "Not only is he a brilliant musician and bass player with an instantly recognizable classic tone, he's also the guy that perfectly represents the wide range of roles bass can play in a band. From a more supporting role to taking a signature bass line that is so pronounced it becomes a lead character in a song - you can find it all in his work, from Guns N' Roses to Velvet Revolver to Loaded. "I think this is perfectly represented in the TonePrint Duff did with us. It's a very recognizable, pronounced sound that at the same time manages to be subtle and blend well with the unprocessed tone. It adds a degree of classy shimmer to it that will appeal to all bassists."